Employee engagement tends to be a bit of a buzzword, but there is some rationale for getting personnel involved in developing or improving your organization’s management system. Involving workers in development and revision of the SMS creates a sense of ownership and shared accountability for results. Creating buy-in for the SMS from the beginning is a powerful motivator for driving and supporting change. As we covered in our recent blog, the policy statement is one of the most important aspects of the SMS. It is the outward facing statement for employees, stakeholders, and other interested parties to see what values your organization commits to. In some organizations, workers are directly involved with customers, regulators, or “customers-of-customers.” More often than not, they will get unofficial feedback from those close to the organization. This information, when properly communicated and leveraged, can result in improved customer satisfaction and documenting / meeting (sometimes unstated) expectations of a regulatory body. When identifying annual goals and objectives, front-line personnel are invaluable. They can participate as part of the goal setting process, and create buy-in / ownership at the levels of the organization where management often times finds difficulty in creating traction. All front-line personnel should be involved in JSA/JHA/JSEA processes by the time the organization looks at SMS development. Another area that can be considered is in the high-level hazard analysis (or PPE Certification of Hazard Assessment). This provides the opportunity for personnel to provide input on lesser known hazards, and give feedback on PPE options for the role. Including PPE, personnel should have an opportunity to provide feedback on (and get an understanding of the organization’s challenges, with respect to) the development of workplace safety controls. This ensure that communication between lower and higher levels of the organization occur and promotes an understanding of considerations, challenges, and opportunities. Identification and reinforcement of appropriate communication channels, especially with respect to safety issues and potential improvements is of paramount importance in any SMS. Humans are poor communicators by nature, and efforts to improve (safety) communication in an organization pay dividends. Frontline personnel are often times able to provide unique insight into incident investigations. They are usually more familiar with “work as accomplished” versus “work as written,” and can be key to identify procedural drift. Involvement here also supports a just culture, as it gives personnel a voice in what has traditionally been a management function. Safety and operations personnel can be trained to help ensure internal auditing of safety-related processes are effective and functioning appropriately. This helps increase the visibility of the importance of safety in the organization’s culture, as well ensuring conformity to the management system. A frequently overlooked area of involvement is the development of safety training. There is a large amount of material that is available commercially and online, but getting frontline personnel involved in the development of safety training can help assist in tailoring the training to your organization’s specific risks, equipment, and procedures. All of an organization’s members should be involved in continual improvement efforts. The personnel who are the most intimate with the work often times have the best idea how to improve processes for effectiveness, help drive conformity with the standard, and reduce non-value added time that drains an organization’s resources. 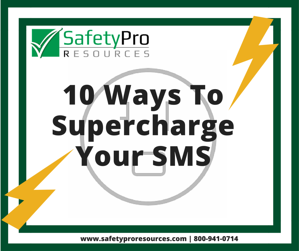 For more information on implementing an SMS, download our comparison matrix to first found out which safety management system is right for your company.